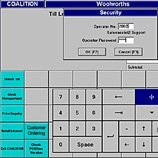 One of the first actions of the new Woolworths after separating from Kingfisher was to withdraw its ordering catalogue, close its call centre and scale its website right back. Four years later, the CEO who had been in post since the demerger, 'discovered' the wonders of e-commerce and decided to base his turn-around strategy for his 500 smaller stores on 'elastic walls' (an extended range ordering system) and a huge catalogue, which he called the 'Big Red Book'. Under the vision money would be invested in the website and in infrastructure behind the scenes to handle fulfilment of the orders, so that shoppers could order any of the wider Group's 300,000 lines at any till in the stores, or on-line, and could choose to have it home-delivered or taken to a store for collection. Clever internal marketing ensured that Stores embraced the concept and really got behind it. Sales rocketed, although, taking all of the costs into account, few orders actually generated a profit. All agreed that the award-winning systems were an important building block for the future, which would sustain the brand for many years to come. 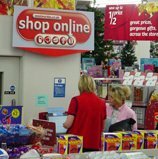 When Woolworths Group demerged from Kingfisher in 2001, one of the first actions of the Chairman, Gerald Corbett, was to scale back the multi-channel operation. Initially he intended to withdraw completely, but was persuaded to keep a small 'Entertainment-only' presence by his well-respected web subsidiary, Streets Online. Streets provided a website for another Group operating company, MVC (The Music and Video Club) and explained that Woolworths could share the same infrastructure, and the iconic brand name could help to drive up traffic. 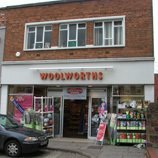 Millions of pounds of investment in woolworths.co.uk and in behind the scenes infrastructure was written off, as Corbett dissolved a strategic alliance with Freemans. Four years later the Group CEO re-discovered e-commerce and made Multi-Channel Retailing a priority. Streets On Line tackled the website, sweating existing assets while also advising the Woolworths Buyer and the team at Entertainment UK on how the range could be broadened. Meanwhile technical whizz Simon Ellis, from the retailer's IT team excelled in enabling a store trial and getting it on-line quickly. The results were very promising in Mold, North Wales (illustrated) and nearby Broughton Park, Chester in the run-up to Christmas 2004. The following Spring a major technical innovation was revealed. For the first time the till system was connected to the Internet in real-time, and was able to load a special version of the website so that sales assistants could place orders for customers. Further integration work would be required to handle payment neatly, but store staff were able to work around this, delivering a very successful trial in Heswall, Merseyside and a dozen surrounding stores. Streets On Line had escelled in harnessing the new Kingstore till system and making it do things that those who had supplied did not believe were possible. The implementation team had to find a way to persuade store colleagues to embrace the new ordering system rather than seeing it as a threat. Strong engagement would be crucial if the infant business was to achieve the CEO's goal of building sales to £300m sales within three years. Good teamwork, backed by a reliable system and strong package of marketing materials helped to secure the launch. A key reason for the success of the store engagement was the decision to allocate all sales made on the Internet to the store that generated them, or the nearest to the customer's home. 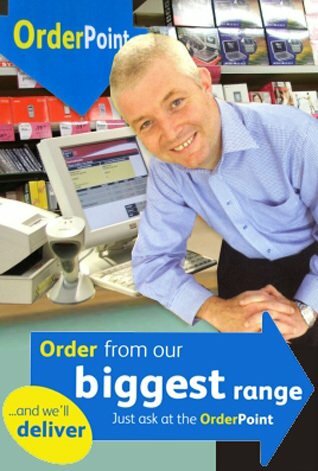 Steve Lewis, the Retail Director, was a strong advocate of In Store Ordering. He embedded it into everyday operations by getting till operators to ask 'did you find everything you were looking for?' and to follow up with 'would you like to order one?'. They embraced the system and reported it easy to use. To the surprise of many observers, rather than simply adding icing to the cake with a few extra sales, stores quickly overtook the website and call centre to become the largest source of orders. Lewis teased members of the IT team by offering them a £20 note, and then snatching them it back, saying 'oh no you don't take cash!' The move followed criticism from customers that the firm only accepted payment by card, to comply with the Mail Order Protection Scheme. When cash payment was added in Spring 2006, alongside an in-store collection service, sales rocketed. Over-the-counter orders accounted for two-thirds of the £70m turnover during the year. The web designers continued their policy of 'write once, use many times', offering free in-store collection to web shoppers as well as extending the range to order at the tills. In 2006 this was recognized with a 'best in world' accolade at the Retail Systems Achievement Awards in Chicago, Illinois. There was more to come, as the CEO announced the most radical move yet. 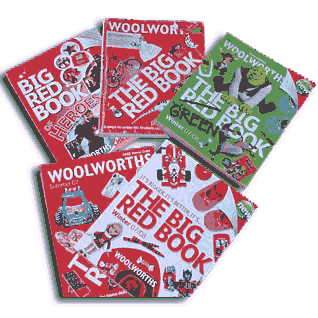 The best of the on-line range would feature in a catalogue, which would be launched in the Autumn 2006 and called 'The Big Red Book'. Woolworths was effectively stepping in to replace Index Catalogue Stores (part of Littlewoods plc which had since moved on-line), taking them head-to-head with Argos, particularly on Toys, Summer Furniture and Electricals. The catalogues introduced new overheads. Higher quality pictures and better descriptions were needed, requiring help from an agency and the establishment of a team at Head Office to receive samples, photograph and describe them. This was funded by trimming the amount spent on brand television advertising. 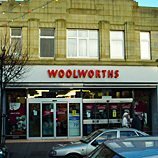 At a time when others were closing call centres and driving their catalogue businesses on-line, Woolworths had decided to buck the trend and encourage customers to order by telephone. Despite great marketing and good strategic vision, the reality was that many multi-channel retail sales were loss-making. Entertainment products, fulfilled within the group by sister company Entertainment UK, and 'direct' orders filled by a supplier, were typically the only transactions to break even. On average the loss per general merchandise transaction exceeded £7. The investment behind the scenes to establish a fulfilment warehouse, a 100-seat call centre at the firm's Castleton office and a state-of-the-art computing platform capable of sustaining peak day sales of £20m, provided a foundation fo years to come. But unlike the most successful on-line operators, the firm did not yet have a simple, efficient supply chain for all products, or a bureaucracy-free operation behind the scenes. Best in the world at the front of house did not imply perfection behind the scenes, or that the economic model could be sustained for long. Trevor Bish-Jones believed passionately that the future lay on the Internet. History has since proved that he was right, and saw the potential to make Woolworths into a major on-line brand. 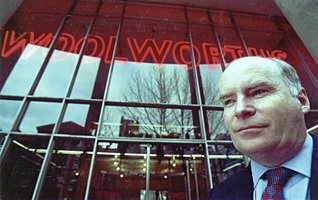 There can be little doubt that if Frank Woolworth had opened in 2009 rather than 1909, he would have headed straight for the web, with its low costs and massive reach, without even considering the High Street. 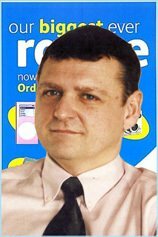 He would have admired the early work by Shop Direct Group when they took the brand on-line, but he would have worked through any problems rather than retiring the brand after a couple of years. But then again his name was Woolworth, and he had a Very big ego.